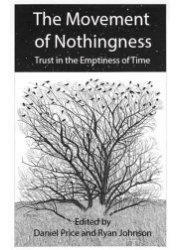 Title: The Movement of Nothingness: Trust in the Emptiness of Time Editors: Daniel M. Price and Ryan J. Johnson Imprint: The Davies Group, Publishers soft cover 388 pp. USD 28.00 ISBN 978-1934542293 November 2012 This collection explores the recent turn to theology in the Continental Tradition as a result of the critique of presence, and the corresponding need to engage with nothingness. The world emerges from out of nothing, from out of that which is not (at least, is not yet). Nothingness, in other words, is transformative. Eleven scholars examine the ways that the emptiness of experience can claim our trust. From thoughtful engagement with the principle texts of diverse theological, philosophical and literary traditions to deeply skeptical accounts of the manipulation of our anxieties, these authors chronicle a new understanding of the movement of nothingness. By insisting on the ultimate framelessness of the question, while moving across numerous fields to stake the argument, the work shows why that tradition of thinking remains relevant for our increasingly technological world. The collection includes never before published work and one never before translated piece. Contents Introduction Two Beginnings The Empty Metaphysics of Literature The Apocalyptic: Trust, a Task, and a Joke Beginnings Jason Wirth, One Bright Pearl: On Japanese Aesthetic Expressivity Thomas Altizer, The Transfiguration of Nothingness Bettina Bergo, Weininger and the (Political) Problem of Categories Ryan Johnson, Shadowplay in Nietzschean Optics Angelica Nuzzo, How does Nothing(ness) Move? Hegel’s Challenge to Embodied thinking The Empty Metaphysics of Literature John Harvey, Walking into Nothing: Directing Samuel Beckett’s Footfalls Andrew Cutrofello, Hamlet’s Nihilism Allessandro Carrera, The Consistency of Nothingness: Leopardi’s Struggle with Solido Nulla Andrew Hass, The Poetics of 0 (as Nothing) The Apocalyptic Daniel Price, Weak Fathers: Sartre’s Absent Joke Petra Carlsson, Post-Representational Theology Astrid Deuber-Mankowsky, Generating the Future: Apocalyptic Forms of Speech in Hermann Cohen’s Work What They Said As The Movement of Nothingness resoundingly testifies, far from being relegated to an obscure metaphysical concept in the current age, the question of nothingness lies at the center of our deepest thinking about existence and who we are. Adventurous and provocative, this scintillating text takes the reader on an journey that traverses culture from East to West, and critically engages with the disciplines of philosophy, theology, and literature, staging conversations with thinkers ranging from the ancient Greeks, Eckhart, and Dōgen to Hegel and Nietzsche, from Shakespeare and Leopardi to Auden and Beckett, to more recent theorists such as Heidegger and Sartre to Derrida, Blanchot, and Deleuze. Following in the wake of the apocalyptic proclamation of the death of God, the insightful essays in this text signal an equally apocalyptic new beginning for both thinking and living. — Brian Schroeder Professor of Philosophy and Director of Religious Studies Rochester Institute of Technology The Editors Daniel Price teaches at the University of Houston, Honors College, and is the author of Touching Difficulty: Sacred Form from Plato to Derrida. Ryan Johnson is a Ph.D. student at Duquesne University, working in the Continental Tradition and focusing on ontology and aesthetics.